Sample tweet: "What's startup-y about a monolithic launch like Color? We need a better moniker than "startup" for such." 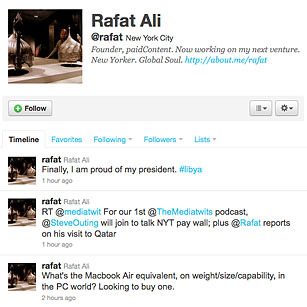 Rafat Ali is the founder of ContentNextMedia Inc. and its most successful venture, paidContent.org, a site that launched in 2002 and has since become a new-media touchstone with its coverage of the economics of digital content. A former tech reporter, Ali sends tweets that are in line with the latest news straight from Silicon Valley, with a dash of snark to taste. See 10 ideas that will change the world.